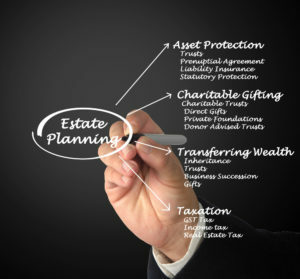 Most folks have at least heard of an estate plan. But fewer realize that a simple will is not enough to prepare for your future. In fact, a combination of plans – financial, tax, legacy, and estate – are vital to your financial well-being and protection of your assets and family. All of these plans are closely linked, affecting one another but also serving different purposes. Contrary to popular belief, in order to get to where you want to go in life you need multiple plans, each intended for a specific area of your life. Tax plan: Tax planning is analyzing your financial situation through a tax lens. Specifically, the purpose of tax planning is to make sure you are taking advantage of all opportunities to minimize your tax bill. For example, you may contribute to retirement plans or decide to sell or buy certain investments as part of your tax plan. Not surprisingly, tax planning and financial planning are closely intertwined. This is because taxes play a large part of many people’s annual expenses. It is important to have several advisors to help you properly craft your financial, tax, legacy, and estate plans for your life and beyond. An attorney’s role is to create and oversee the legal structure that serves as the vessel through which your plans achieve your goals. A wealth or financial advisor’s role is to handle the financial planning aspects to make sure you are on track to meet your goals. An accountant integrates tax planning through careful analysis of the latest tax laws applicable to your particular situation. Your clergy or spiritual advisor can provide you help in crafting your legacy plan. In short, not only should you have all of these plans, but you should also consult with professionals to help you create and execute them successfully.